Was there ever any doubt that Guinness Extra Stout would be my Irish beer? No, of course not! This beer is famous around the world, and is universally loved by some and hated by the rest. Despite production in more than 50 countries Guinness tastes remarkably similar wherever you drink it, with the alcohol percentage being the only real change. While I would normally drink this beer only on tap I didn't think I could stomach buying a whole keg of it! This is the Australian version of Guinness so hopefully it will stack up. 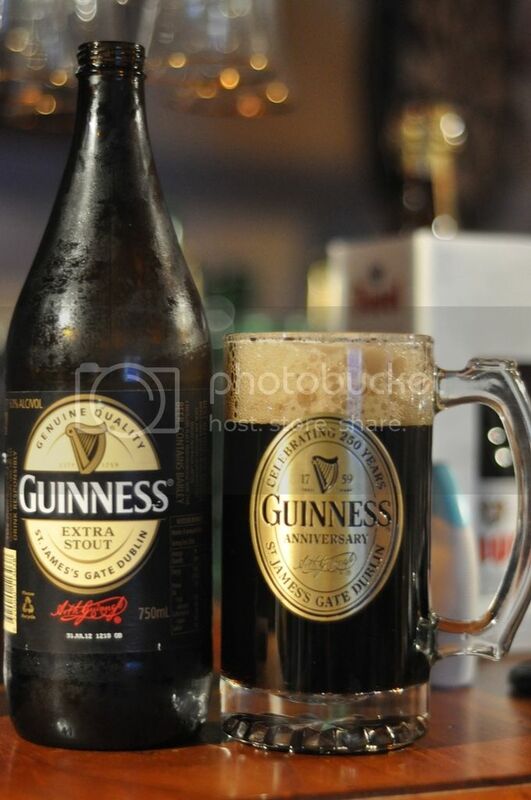 One of my favourite Guinness facts is that Nigeria is the third biggest consumer of it behind Ireland and the UK, very strange! Being such a popular beer this is a hard one to review, I'd love to hear from any of you who agree or disagree. Anyway bring on 'the black stuff'. Because it's not Guinness Draught I did not attempt the perfect 119.53second two part pour recommended by Guinness. The beer appears quite thick and is incredibly dark with a tan coloured head. The head appears to have move bubbles than an average Guinness head and doesn't look as thick. When you hold this beer up to the light you can just make out a slight red tint to the beer, however you have to look very hard. You would have to say this is (almost) the perfect looking Irish Dry Stout as it is the one everyone compares all others to. It smells just like any Guinness, lots of roasted malts. The malts smell slightly of chocolate but in a strangely savoury way, they don't smell sweet in anyway. The sweetness strangely enough comes from the hops, which seem quite light and have a fruity smell. The head again smells different, and has a creamy caramel aroma. It's a lovely smelling stout. Guinness tastes alot like it smells, the roasted malts hit you straight off the bat and are excellent. They also have a slight bitterness that was not detectable on the nose, almost like that of coffee. This Guinness is very different to Guinness Draught however it still has the creamy warm mouthfeel of the Draught. It's not as thick as it appeared and the low carbonation would make this one a really easy drinker.